We all know that One More Day was one of the Spidey-arc that only a few fans liked. Personally, I hated that arc. It robbed me of one of the most beautiful relationship in comics. It was a good thing I still have the comic strips to look forward to. Before OMD, I was an avid fan. I bought The Amazing Spider-Man on a regular basis, atleast as regular as my allowance will allow it. But after OMD, nope. Never again. According to the news and speculations I have stumbled into (thank you Internet! ), it seems that this will not be the status quo. But just an interim story before they end the current Marvel Universe with the Secret Wars mega event. Marvel decided that they needed a clean slate like what DC made a few years ago with the New52. The only difference with Marvel's reboot, they decided to collapse the Ultimate Universe into the 616 Universe. There are speculations that if we're going to interpret the picture above, Marvel may be thinking of retiring Peter Parker's Spider-Man and replace him with the current Ultimate Spider-Man, Miles Morales. Some even say that Peter will be acting like an Old man Bruce Wayne to Miles' Terry McGinnis. 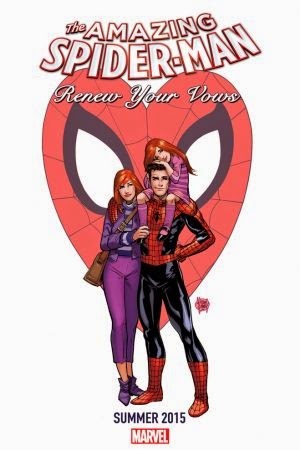 All I am hoping for my future Spider-Man stories is that they return his marriage with Mary Jane. It was one of the reason why I believe in Spider-Man so much. That with all the difficulties he has and all the challenges in his life, he still has this strong connection to the people in his life that it allows him to keep on moving. He still has an anchor so he does not slip into the other side. I hope this will be the future status quo. A Peter Parker Spider-Man mentoring a Miles Morals Spider-Man. Something to look forward to. I wish I don't get disappointed.